Mr Blair went to Menindee to see first-hand what he describes as an “environmental catastrophe”. He was surrounded by angry locals at a riverbank press conference, who say the deaths were caused by a NSW Government decision to drain the Menindee Lakes in 2017. They also slammed the minister for not doing enough to stop the extraction of water by cotton growers. Meanwhile, Deputy Prime Minister Michael McCormack has been slammed for spending his time dressing as Elvis Presley instead of visiting the affected communities. Mr McCormack attended the Parkes Elvis Festival this year, in full 1970s regalia, but said he was making “arrangements” to meet with Menindee locals. “The fact is we are experiencing an incredibly prolonged dry period. When it doesn’t rain in the catchment, the water doesn’t flow down the Darling,” the Nationals leader told Channel 9. “Unfortunately these sorts of things happen. But we are working very hard with basin states, as the Commonwealth, to make sure that we address this issue. Locals and experts say droughts have come and gone without mass fish deaths before, and that this incident must also be linked to government decisions about water releases. A leading river ecologist has warned fish populations may never recover from the Menindee fish kills. Director of the Centre for Ecosystem Science at University of NSW, Professor Richard Kingsford, says the deaths are occurring at an unprecedented magnitude. 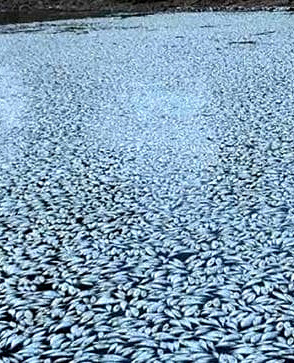 “I’ve seen a fish kill on Lake Eyre which is a natural phenomenon when it goes salty, but not on the Murray-Darling – I’ve never seen a fish kill of this magnitude,” he told reporters. Professor Kingsford is on the Australian Academy of Science’s panel of experts to review the situation.